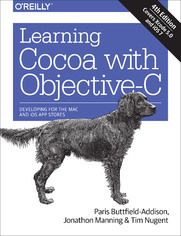 Get up to speed on Cocoa and Objective-C, and start developing applications on the iOS and OS X platforms. If you don&#8217;t have experience with Apple&#8217;s developer tools, no problem! From object-oriented programming to storing app data in iCloud, the fourth edition of this book covers everything you need to build apps for the iPhone, iPad, and Mac. You&#8217;ll learn how to work with the Xcode IDE, Objective-C&#8217;s Foundation library, and other developer tools such as Event Kit framework and Core Animation. Along the way, you&#8217;ll build example projects, including a simple Objective-C application, a custom view, a simple video player application, and an app that displays calendar events for the user.